Without a doubt, the biggest gaming phenomenon of Japan this year involved the game which had anime girls as battleships. It's too bad that most people outside of Japan can't play it. Since April, when the game officially launched, its explosive spread quickly forced the administrators to close registrations and only allow for a limited number of new players each day – ostensibly rendering the "invite friend" button completely useless for the past 6 months. Where there used to be only 4 servers back in July, there are currently 15. "As of December 26th, over 1,400,000 Kan Colle accounts have been registered. We believe the growth will eventually slow down, but so far the numbers continue to increase. Roughly 75% of the accounts are active users, of which currently 550,000 are daily active users (DAU). We would like to extend our gratitude to all the admirals who support us." One might argue that, of games released in 2013, Kan Colle doesn't really hold the crown in terms of sales (Pokemon X/Y clocks in at 3.5 million units sold, Monster Hunter 4 3.2 mil, Puzzle & Dragons boasts 22 million downloads), but as a gaming phenomenon, nothing else this year comes close. As a game, Kan Colle is relatively simple. You start out with one destroyer-class fleet girl (aka Kan-musu, 艦娘) and quickly build or acquire more throughout your campaign. You send out your fleet (you can eventually have up to 4) onto the high seas to defeat enemy ghost ships. There are different classes and types of fleet girls, all of which you quickly become familiar with as you play. Every fleet girl is based on an actual historical WWII warship and the developers' love and knowledge of Japanese warships can be seen through the minute details in design. Much of the game is luck-based – be it which fleet girl you draw, or the outcome of battle. While this can lend itself to lots of frustration, especially on the harder maps, it also makes the playing field relatively level for newer players. Even ships like Yamato, which are initially offered on a limited basis, are eventually accessible to everyone. Thanks to the backing of publishing powerhouse, Kadokawa, there's no end of licenced goods. With multiple comics, a light novel series, a metric f**kton of merchandise, and an anime on the way, it's hard to argue with the popularity of this free-to-play browser game. There was also an official tie-in café that was open for a limited time. Aside from the officially licensed stuff, there's also the fan-made side. Mountains of artwork and videos, cosplay and even a song that can now officially be sung at karaoke. Apparently, nearly 30% of the indie comics registered for this year's Comic Market 85 (aka Comiket, Japan's biggest bi-annual indie comic convention) are all of the Kan Colle genre. One of the benefits(?) of the popularity of the game has been the influx of people interested in WWII warship history. For example, I only learned that there was actually a second Yamato-class ship, Musashi, through playing the game (It's like how a lot of people don't know that the Titanic had 2 sister ships). This has also led to an increase in warship model sales – the normal kind. Not the 1/100 scale type. 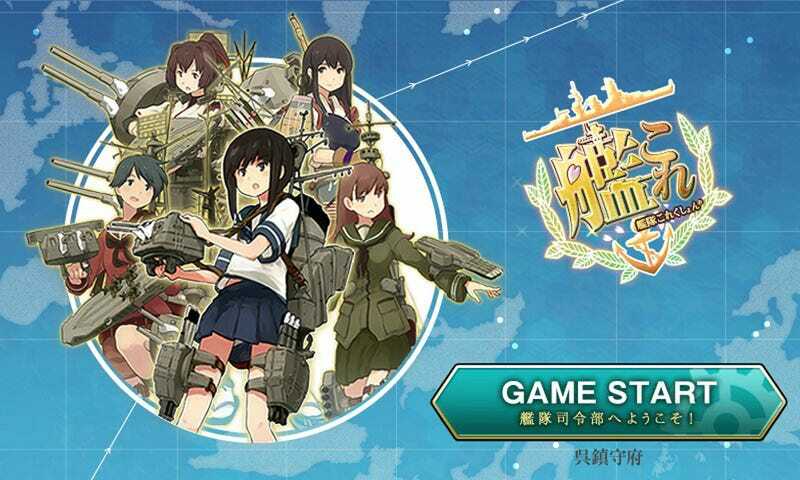 Kan Colle is a free-to-play game with payment-based elements. This isn't a particularly unique model of game operation. What is unique is the fact that the administrators actively discourage players from paying for content. The game can be played to its fullest without paying for anything, and nothing is closed off behind a pay wall—except for maybe some convenience. Perhaps the only thing that is really worth spending any actual money on is expanding your repair docks, but even that is not entirely a necessity. The latest ship-building feature, the large-scale/new ship building, actually has a pop-up message that advises players to think economically about their resources and avoid paying for content. The Large-Scale/New Ship Building system allows for the creation of large battleships and newly added ships. However, it requires large amounts of resources. Resources replenish over time or can be acquired through expeditions. Please avoid purchasing resources and wait until you have accumulated enough to utilize what resources you can gain within the game." Currently, Kan Colle is restricted to IP addresses accessing from within Japan. This means that the only way for people outside of Japan to play is via proxy – which many do. A more accessible PS Vita game, Kan Colle Kai, is scheduled for release next year, although no international release has been announced. At its current rate, Kan Colle will probably surpass the 1.5 million and even possibly the 2 million registered user mark. Its popularity among the Japanese subculture also shows no signs of waning. If its luck holds, it could end up being the biggest phenomenon of 2014 as well. Note: For those of you who think they should somehow incorporate the ships from Arpeggio of Blue Steel... They already did.